Sure, online shopping has practically become a new favourite sport, but when it comes to online photo printing, the benefits extend beyond avoiding the hassles of finding a park, navigating the crowds or being greeted by closed doors. At the Canvas Factory, creativity is King, choice is Queen and style is all around. But why should you enter the kingdom in the first place? And what can you expect once you step inside? Here, we give you the keys to the printing palace. 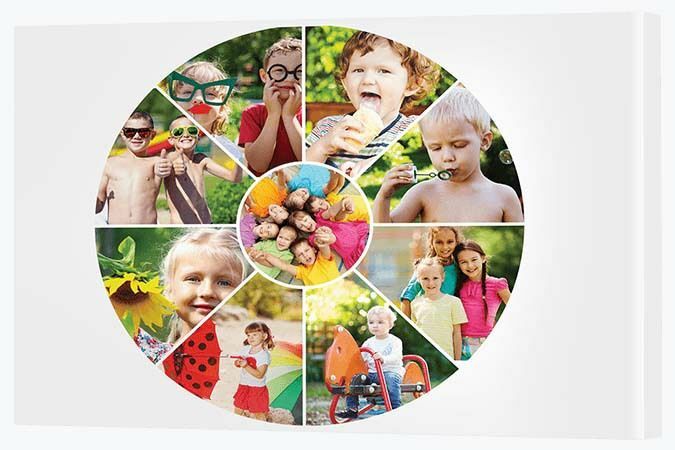 With online photo printing, you can take one or multiple photos and display them in a multitude of ways. As our collages cost the same as a single print, it may be tempting to choose a collage as a way to print as many photos as possible. However, single prints can often hold more impact. Select the hero shot from your photo collection. You know the one. It’s the one that gets all the oohs and ahhs (or the most likes on Facebook!). That’s the photo that will look outstanding as a single print. When styling your single print online, you can crop the photo yourself. Don't be afraid to do so! While your photo may have been shot as a landscape or portrait, a square print may be a better fit for your wall space. Our Canvas App lets you resize in a live environment, so you can test to see what style and shape best suits your photo. Same photo as the single print above, but split across three panels. Effective isn't it? Not every photo suits a split image print, but we say every photo deserves a go. Designing online gives you this flexibility. All you have to do is select the split image option on our Canvas App, upload a photo then manouvre it to see if the style will suit. Try moving the photo around the canvas layout. Try zooming in and out. If your photo is of people, the trick is to avoid chopping off essential parts of their bodies. If your photo is of a place or something from nature (e.g. a flower garden), be sure the main feature of the photo remains the focal point. Pets, animals, sunsets and landscapes often look amazing as a split image, so if you enjoy a creative decor and love a more arty style, this is definitely the way to go. Wall displays are the premium canvas option so it pays to take time and get it right. You get this freedom online. When it comes to wall displays, bigger is always better. However, it's important you take care to measure your available wall space first before deciding on a size. We've made this job easier for you by including the measurement of each canvas frame in our Canvas App. 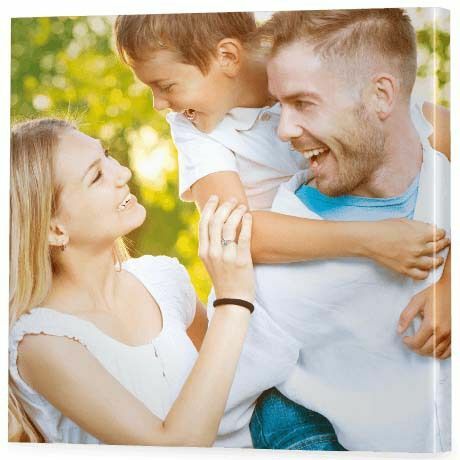 Canvas photo displays are a wonderful way to tell a story or share a journey. Collages remain one of our most popular purchases and it's easy to see why. 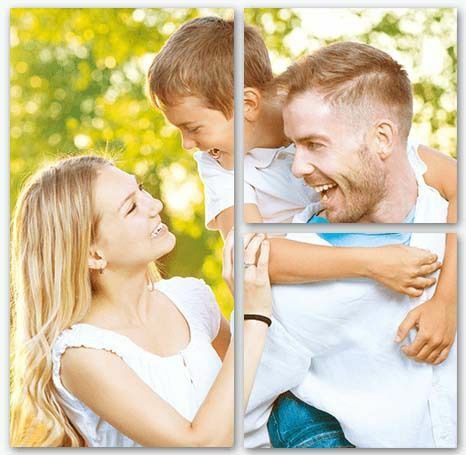 Collages provide the most affordable way to feature more than one photo as the display all sits on a single canvas print. It may only take 5-10 minutes to create a collage online, but when it comes to choosing which style to go with, it may take a bit longer as you are totally spoilt for choice. First you have to decide whether you want a traditional collage, a themed collage, a modish collage or a silhouette collage. Some gems include a 'Live Travel Adventure' holiday themed collage, a romantic modish heart collage and a pet paw silhouette collage. Then you have to decide which of the designs you like within those styles. It's such a wonderful problem to have! 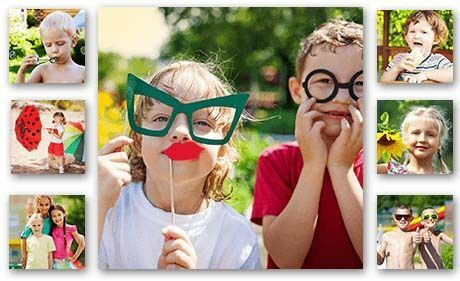 Collages make for a great DIY craft project, so find some quiet time to be creative or get the kids involved to help out. It's a really fun online activity. Enjoy! With so many styles available to you at the click of a button, the only decision left to make is how small or large you'd like your print to be. As you browse our website, you'll see we've listed our most popular online photo print sizes. However, within our clever Canvas App, you'll be able to choose from the complete range. When designing a wall display there's a bit of maths involved, but if you use our online canvas creation tool you'll see we've done the hard work for you. It doesn't matter how big or small your space is (or how big or small your budget is! ), the key is to measure your available space first then choose the print size. From an interior design perspective, it often makes sense to centre a photo print above a piece of furniture, for example, a couch, a cabinet or a bed. Measure the width of the item of furniture then measure the depth from the ceiling to that item. You can have it span the full width or leave some equal space blank on each size of the print. 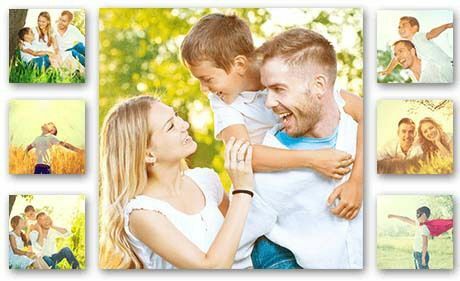 With a contemporary online print shop like ours, one set of photos can be printed in so many different ways. It all comes down to taste. Take these wedding photos as an example. This modish heart collage has been wrapped in a pale pink canvas frame, giving it a soft feminine feel. This canvas would suit a woman's retreat, sewing room or office. 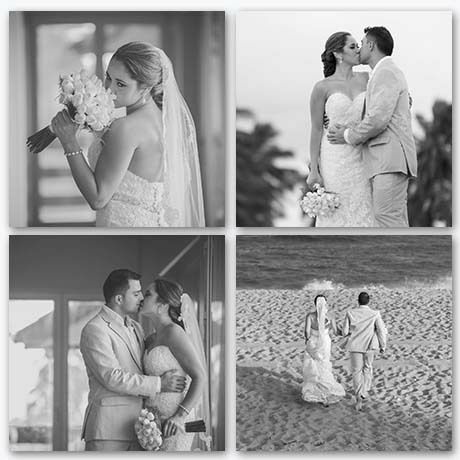 She loved her wedding day and wants to treasure the memories. This canvas is for her and for her alone. Here we feature the same series of wedding photos, but have achieved a completely different look. This look, just by changing the colour and design of the canvas, results in being less overtly feminine and therefore has a more universal appeal. That's the beauty of monochrome. Taking away colour often ends up adding greater impact. With colour removed, we tend to spend more time getting lost in the detail. So while its tempting to play with colour, sometimes it's worth keeping it simple. That said, if your wedding day was all about the colour, you can print online in full colour for the same price as black and white. Printing straight to canvas saves time and it saves money. You don't even have to leave the house! These days, photo frames only look good if you spend a lot of money on them. Otherwise they're just crappy bits of plastic or wood that take away rather than add to the overall look. 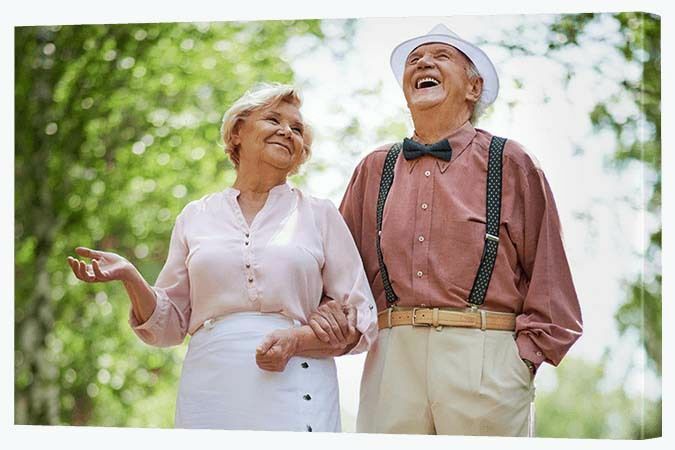 Printing online, directly to canvas, means your photo is not only free of the trappings of a frame, but it's free of the costs of those trappings as well. 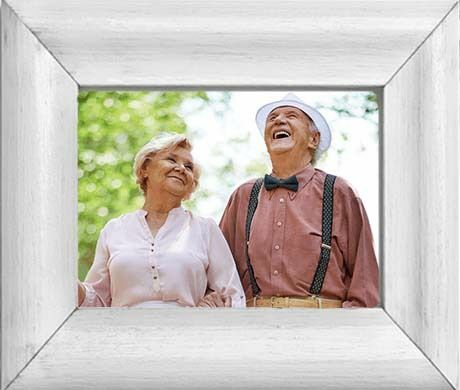 You don't have to shop for a frame and you don't have to pay to print a photo only to fork out more funds for a frame. With online canvas printing, it's all one transaction. 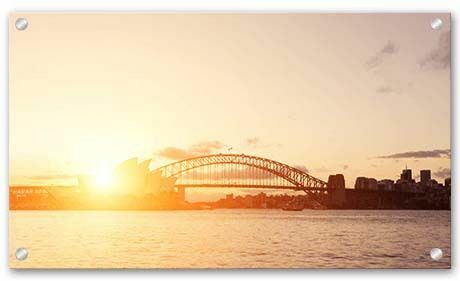 The photo is printed directly onto the canvas, wrapped around a frame, mounted ready to hang and delivered to your door. Going frameless provides so many options at no extra cost. It's just brilliant. With canvas, the frame is included but it's hidden. Your photos are wrapped around the frame. It achieves a contemporary upmarket look without the expensive price tag. Using our online tools, you can decide how you want your image wrapped around the frame - a gallery wrap or a mirrored wrap. You can also decide to leave your wrap photo free and colour it instead. Told you it was brilliant. Warning! Printing to canvas online can be a stepping stone to a glass and metal addiction. While canvas is our most affordable option, printing on acrylic glass or brushed aluminium offers something a little extra special. 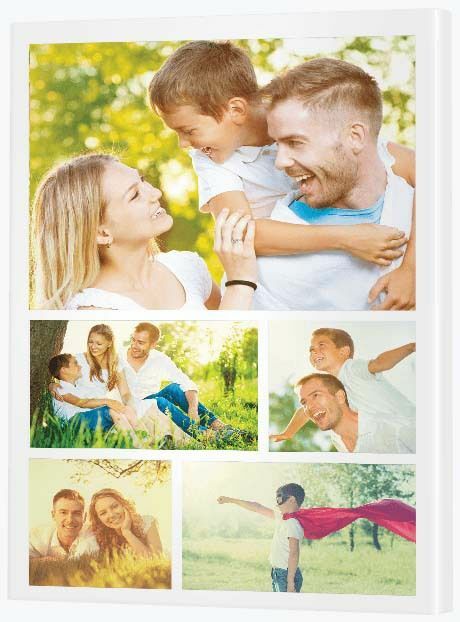 While canvas has a quality finish and natural feel, acrylic glass makes your photos shine - quite literally. If you want to take online printing to the next level of awesome, brushed aluminium is the way to go. A baby print is cute on canvas, but it becomes incredible when printed on aluminium. Brushed aluminum is robust, so you can hang your baby print (or other awesome print of choice!) in a number of different spaces throughout your home. Brushed aluminium is sleek and stylish, so it becomes a wonderful addition to areas of your home where you may otherwise only choose to feature high art. 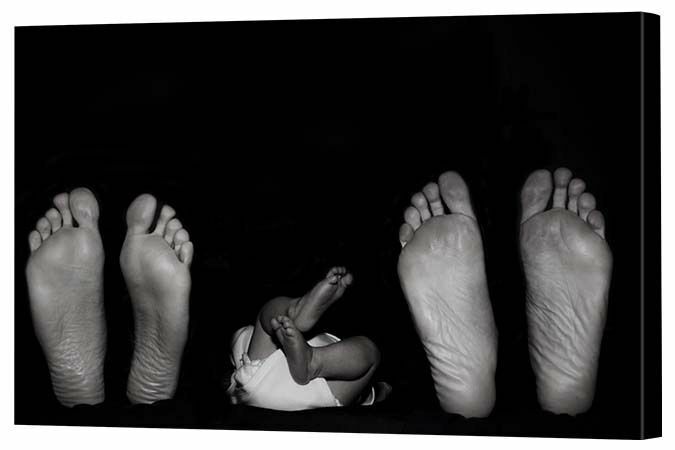 When printed on metal, your baby photo instantly becomes high art. Leaving aside talk of babies for a moment, metal prints are a wonderful material to display funky urban art and fine photography. The way brushed metal catches the light means it can look different from one moment to the next depending on the type of light and viewing perspective. It's really quite an extraordinary material. However, if you're not yet ready to give it a go, baby steps are fine. Fall in love with canvas first and you'll see a whole world of possibilities open up before your eyes.